The stunning live plant wall at the entrance to the Hinkley Lighting showroom, during January 2019 Lightovation at Dallas Market Center. I’ve been back a week now from the January 2019 Lightovation show at Dallas Market Center and am finally able to sit down and write about what an amazing time I had there. As some of you know, I was invited to be the keynote presenter for the January 2019 Lightovation show, a bi-annual event that takes place in January and June within the Dallas Market Center complex. Lightovation is the largest wholesale lighting tradeshow in North America. It is managed and leased by Laura Van Zeyl, the Vice President of Lighting Technology Development and Marketing for Dallas Market Center. You can read more about Laura on this post I wrote before I left. In addition, Lightovation also invited me this time ( you might remember that I gave the keynote presentation to open their #SMARTcenter in June of 2018) to give 3 additional Deep Dive presentations on various aspects of digital and social media marketing that could help Lightovation and Dallas Market Center attendees understand how to use these tools to move their sales powerfully forward, faster. The presentations all took place in the #SMARTcenter, a 6000 sq. foot state of the art meeting and seminar facility located on the 4th floor of the Trade Mart building at Dallas Market Center, and co-operated in partnership with the American Lighting Association. (A special shout out to the team at the ALA for being so helpful in setting everything up, especially Dir. of Education, Nici Juneau). When I was there in June, they had not yet applied the color blocked paints at the entrance and I loved seeing how beautiful it looked this time, all finished out. So sophisticated, happy and welcoming! I also just LOVE the new tagline for LIGHTOVATION —> #wherebrightmindsgather. How brilliant is that? On the day of the keynote presentation, Tuesday, January 15th, I was so happy to see my friend, Deborah Main, in the audience. Deborah is the owner of the Pillow Goddess blog, and is also an artist whose medium is pillows. Her pillows, made of vintage textiles and trim are stunning and I featured her pillows on this post I wrote about How To Set Up Your Instagram Feed To Be Shoppable, Even If You Only Have One Follower. I’ve known Deborah for a long time now, a fellow Texan ( I live just south of Houston in League City, TX and Deborah lives in Austin ) and, without fail, Deborah has always been so supportive of my work and this show was no exception. She chose my keynote presentation as her #1 Top Pre-Market Pick to see on this post she wrote on her blog, here. This is a picture of Deborah, Laura and I taken on Deb’s camera (not sure who took it!) before my keynote presentation. Deborah: thank you for all of your support over on your PILLOW GODDESS blog on www.deborahmaindesigns.com! The keynote presentation went well, and I sincerely appreciate all of you who attended who might be reading this. Also, there is a LIGHTOVATION - Lighting Industry Discussion Group on Facebook. This is a PUBLIC Group, and if you are interested in the lighting industry and in joining & continuing the discussions, please come back after reading the rest of this post and click HERE to Request To Join. I also invite you to LIKE LIGHTOVATION’s main Facebook Page, here, to keep up with all their future events. FYI: Hassan was at LIGHTOVATION all the way from Dubai, and the lighting company he works for is wanting to transfer their operations here. A happy me, right before my keynote presentation. Photo courtesy of Deborah Main. Thank you, Deb! Before and after my keynote presentation, I had the opportunity to walk around the LIGHTOVATION show for a little while. I saw SO MUCH incredible lighting. I’m going to share just a few of my own personal favorite things, although I saw a lot more. The one line that truly stole my heart was Hubbardton Forge. This hanging fixture from their new SYNCHRONICITY collection ( I love that name! ), was breathtaking. I took this picture so if it’s not perfect, know that it’s not from their catalog. It’s always hard to see from pictures if the quality is really there or not, but I can tell you, it 120% IS. I was shown around their showroom by David Kitts, Hubbardton Forge’s Vice President of Design, who was so nice to take time out of his busy opening day to share with me the story behind some of these pieces. You can follow David on Instagram, here. I also took this picture, a detail from their new NEOLITH hanging fixture. Look at that ironwork! It was PERFECTION..not a solder mark in sight. 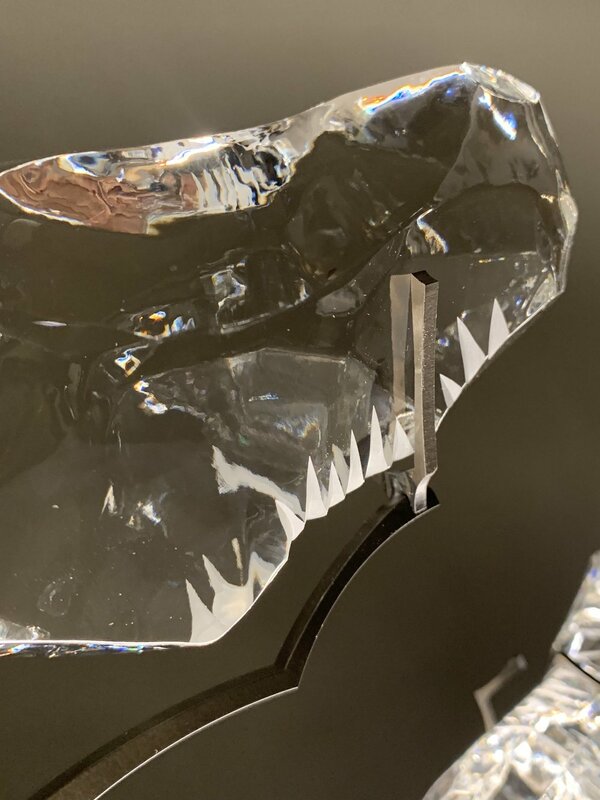 The crystals on this fixture ( I think there are 5 of them) can each be turned individually on their iron stems to create different shadow play opportunities depending on the time of day. Later on in the week, Vermont based Hubbardton Forge took home TWO Arts Awards at the #ArtsAward gala and it was easy for me to understand why after visiting their showroom. They now have a lifelong fan in me! Another lighting line that really caught my attention was SONNEMAN LIGHTING. Way back in the days (almost 20 years ago now!) when I was still doing luxury interior design work for clients, I specified and sold Sonneman Lighting’s fixtures frequently. However, it had been years since I’d seen their line, and having the opportunity to see their showroom now was a real treat! Their new CONSTELLATION lighting fixture took my breath away. I loved the ability to reconfigure this fixture in any way that worked for a room and the ability to do that to match any astrological sign. I know a few of my past clients would have loved having their astrological sign writ large in light! I also got to re-connect with Alecia Wesner, one of the most respected and well known lighting designers in the industry. She’s been designing for George Kovacs Lighting for many years (now owned by the MINKA GROUP) and was nice enough to take time out of her busy day to show me around, too. See that jewelry? Unbeknownst to me before seeing her here, Alecia is also a very well known jewelry designer and I just loved seeing how her lighting designs for George Kovacs are reflected in her jewelry designs! Keep scrolling for an example. This is Alecia’s well known NECKLACE hanging fixture for George Kovacs Lighting. If you’d like, you can purchase it by clicking > here. If you do, I will make a small commission, but it won’t cost you any more than if you bought it directly. This is the merchant’s way of thanking me for featuring it on my blog. This is Alecia’s bracelet, which she sells via her ETSY shop, here. Isn’t it wonderful when women are as multi-talented in various disciplines as Alecia is? It’s always nice to take the time to ask someone about their story. You never know what you will find out! On the following days, Wednesday and Thursday, I saw some great friends starting with running into Gary Inman in my hotel. Gary and I volunteer on the board of the Bienenstock Furniture Library together and have been long time friends. He’s the Vice President of Design for hospitality giant, Baskervill and involved in many other industry related events. He’s so respected and one of the nicest men I know in the industry. The day after this picture was taken, Gary and I had a chance to catch up for a little bit over breakfast in the hotel’s restaurant. One of the best things about attending any tradeshow like this, for me, besides being there for what I’ve been hired to do, is to synchronistically run into people I know, that I don’t get to see very frequently, like Gary. And although I don’t have a picture of us together, I also ran into my good friend, Julia Molloy, the founder of the BOLD SUMMIT, looking dazzling - as she always does! We had a lovely chance to catch up for a few minutes before we both had to go in different directions. Also during my time in Dallas, I was treated to dinner by one of my great past clients and now good friends, interior designer Leslie Hendrix Wood of Leslie Hendrix Wood Interiors in Midland, Texas, and the owner of the HADLEY COURT blog. Leslie took me to The Mansion On Turtle Creek for dinner, where we enjoyed quietly catching up with one another over a delicious meal. Leslie recently went on an around the world trip, and shared with me pictures from that trip, some of which you can see on her Instagram feed and in her Insta Stories, by clicking > here. See that table in front of the fireplace? That’s where we ate. It was such a gracious, lovely respite after all the busyness of the day! And for all of you that don’t know, it was Leslie who donated the funds for the renovation of the state of the art seminar room at the Bienenstock Furniture Library that now serves as the Hadley Court Center For Design Collaboration. Although she’s no longer serving on the board, her contribution will always be remembered by all of us who love the Library and what it represents. The dining room at The Mansion on Turtle Creek. My other three presentations for Lightovation, one on how to optimize your GOOGLE MY BUSINESS listing to appear higher on Google Maps , one on advanced targeting for Facebook Ads and one on Deep Dive Tips For Instagram Success, seemed to have gone over well, based on the feedback I received afterwards. 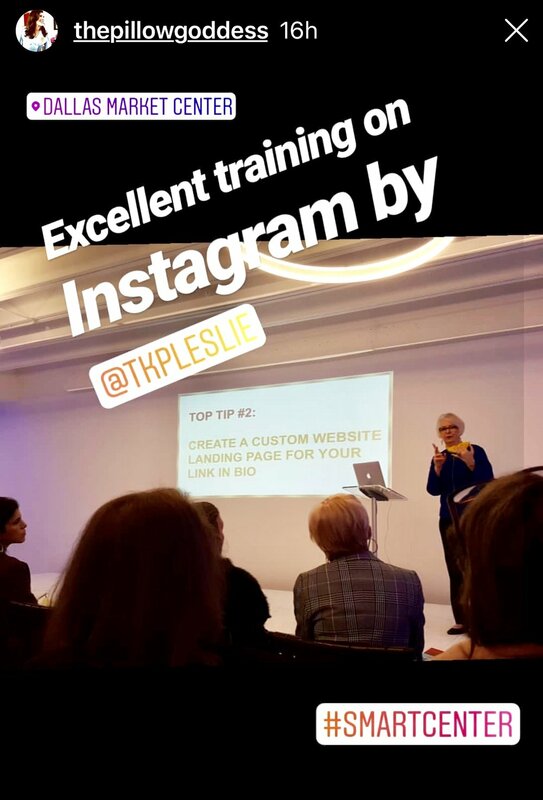 Deborah, who attended all of my presentations, shared her thoughts about what she was learning in her INSTA STORIES, shown below. It is TRULY a wonderful feeling to know that the people who were kind enough to take their valuable and limited time to attend any or all of my presentations, came away from them feeling like they really did learn information that would help them propel their sales powerfully forward. Thank you, one and all, for coming, and for your kind comments afterwards. And Diane Falvey: thank you for posting constantly about what you were learning and congratulations on your new position as Editor In Chief of Furniture, Lighting and Decor magazine! On the last day, Friday, I was invited to be the interview guest of Sarah Daniele, the CEO and co-founder of design management software company, MY DOMA STUDIO, for a presentation to interior designers in the ZUO MODERN showroom on Passive Income For Interior Designers. Serena Martin, the super smart and savvy Vice President of Marketing for ZUO MODERN, wrote a blog post about the event before it happened, which you can read by clicking > here. Thank you, Serena, for hosting us in your colorful showroom! Sarah wrote this blog post after the event was over, which you can read by clicking - here. If you don’t yet know about the wonderful tools that Sarah has available through her site for interior designers, make sure to reach out to her. She has a wonderful widget available for your websites (60.00/mth) that makes it very easy for you to make money 24/7 from your e-publications and digital products! It was also fun to meet, for the first time, a few of the interior designers from my Facebook Group, #DesignWealth, who attended and to see friends I’ve known for awhile, too, like Lori Carpenter. And again, Deborah Main was there, capturing it all in her Insta Stories! Thank you, Deb! The Zuo Modern showroom was so bright and colorful! It was fun to see Friendswood, TX based interior designer, Tracy McBee Johnson of TWO THIRTY INTERIORS there, too. Tracy lives about 30 minutes from where I live and we’ve gotten to know each other because of that. Thank you, Tracy, for coming! Are you following Deb on Instagram yet? Do it —> here. Speaking of my Facebook Group, #DesignWealth, I invite any of you that are interior designers to join it by clicking —> here. It is not a large group yet compared to some others, there are only about 865 or so interior designers in it, but the designers that are there would tell you, I think, that they are learning how to #DesignWealth through Passive Income generation into their blogs and websites by being a part of it. Some of the designers in it are, or have become, our Savour Partnership clients, too, and we greatly appreciate them! I invite you to meet them on this link on our website —> www.savourpartnership.com/clients, where we have live links to their social channels, their blogs and their websites so it will be easier for you to subscribe and follow them and - if you are a brand reading this - to meet them and partner with them for influencer marketing opportunities. We are blessed to work with some of the best interior designers in North America. Again, the link to Request To Join is: http://facebook.com/groups/designwealth. The last wonderful part of this week was attending the #ArtsAwards on Friday night, the Oscars of the furniture industry. Sarah Daniele was my table guest and I also sat with nationally known interior designer Cheryl Clendendon, a good friend who was a first time nominee for an #ArtsAward in her category of Home Accent Stores. Although Cheryl didn’t win this time, her Pensacola, FL based store, In Detail Interiors, is a gem that deserves to win at another time and her interior design work will be featured in the upcoming issue of Seasonal Living Magazine, out Feb. 15th. This magazine is a bi-monthly consumer facing digitial luxury lifestyle magazine that our company is producing for 5 time #ArtsAward winning indoor outdoor furniture, cordless lighting and decorative accessories manufacturer, Seasonal Living Trading Company, HQ’d in Austin, TX. Read more about Seasonal Living Magazine by clicking -> here. This is a picture I took of Cheryl that night. Doesn’t she look beautiful? This is a two page spread from a past issue of Seasonal Living Magazine, featuring San Miguel de Allende based interior designer, Rachel Horn of Rachel Horn Interiors. We can’t wait to feature Cheryl’s beautiful work in our next issue! If you haven’t subscribed yet (it’s free to do), please click here. You’re not going to want to miss this next issue! Winning the #ArtsAward, in 5 separate years, is a difficult and significant achievement for any company, and Seasonal Living was the first indoor/outdoor furniture manufacturer ever given the honor of being inducted into the Arts Award Hall of Fame. There were several other highlights to this evening, as well, and they are well documented across the internet on the hashtag, #ArtsAwards. This short video I took when I first arrived in the grand ballroom gives you an idea of the immensity of the production of the #ArtsAward gala every year. I do want to say congratulations, too, to Sharon Davis, who has been the executive director of the Arts Awards now for the past 30 years. Sharon was honored this year for her years of service and seeing her daughter, Erin, speaking about her Mom up on stage, was a touching moment for all of us that were there to witness it. Lastly, I want to say thank you to the Editor In Chief of Business At Home magazine, Kaitlin Petersen, for writing a wonderful article about my background and my presentations, which went live on the Business of Home (formerly Editor At Large ) website before my presentations. This interview was set up by the marketing team at Dallas Market Center, unbeknownst to me, and I had no idea Kaitlin was going to include so much information about my background in the article. All in all, as you can see, it was a wonderful week, packed full of excitement, work, friends and all the beautiful things that make my heart sing! I will leave you with one of my very favorites….this new lighting fixture for Hinkley Lighting by California based interior designer, Lisa McDennon. In person, this hand blown glass hanging pendant was so beautiful. For all of you reading this who may never have been to Dallas Market’s LIGHTOVATION show, I encourage you to attend it at least once a year. It is a tour de force of beauty at every turn. Again, thank you Dallas Market Center team, Lightovation team, American Lighting Association team and all friends who made this week so special! For all the new friends I met -> it was so nice to meet you and I hope to see you again in June! If we can help your business in any way, with passive income development via our digital publications or your digital/social media marketing needs, please reach out to me at leslie@savourpartnership.com.